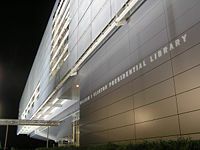 In the United States, the Presidential library system is a nationwide network of libraries administered by the Office of Presidential Libraries, which is part of the National Archives and Records Administration (NARA). These are not libraries in the modern sense, but rather repositories for preserving and making available the papers, records, collections, and other historical materials of every President of the United States since Herbert Hoover. Presidential libraries began with the thirty-second U.S. President, Franklin Delano Roosevelt. During his presidency in 1939, Roosevelt offered Presidential and personal documents to the government and promised to offer a part of his estate at Hyde Park, New York. The Franklin D. Roosevelt Presidential Library and Museum was established with the funds raised by his supporters and NARA took custody of the library upon the request of Roosevelt. The first Presidential library was established in 1941. Presidential libraries are unique to the United States. Recent U.S. presidents have established presidential libraries in their home states in which documents, artifacts, gifts of state, and museum exhibits are maintained that relate to the former president's life and career. Each library also provides an active series of public programs. When a president leaves office, the National Archives and Records Administration (NARA) establishes a presidential materials project to house and index the documents until a new presidential library is built and transferred to the federal government. The William J. Clinton Presidential Library became the eleventh presidential library on November 18, 2004, and the Richard Nixon Presidential Library and Museum became the twelfth on July 11, 2007. The presidential library system is made up of twelve presidential libraries operated by the NARA. Libraries and museums have been established for other presidents, but they are not part of the NARA presidential library system, and are operated by private foundations, historical societies, or state governments, including the William McKinley, Rutherford Hayes, Calvin Coolidge, Abraham Lincoln, and Woodrow Wilson libraries. 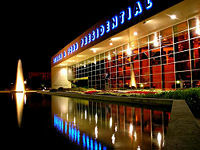 For example, the Abraham Lincoln Presidential Library and Museum is owned and operated by the State of Illinois. The Richard Nixon Library and Birthplace was not originally part of the presidential library system. While the Nixon Presidential Materials Staff, which administers the Nixon presidential materials under the terms of the Presidential Recordings and Materials Preservation Act, is part of NARA, the Richard Nixon Library & Birthplace was run by a private foundation. In January 2004, Congress passed legislation that provided for the establishment of a federally operated Richard Nixon Presidential Library in Yorba Linda. In March 2005, the Archivist of the United States and John Taylor, the director of the Richard Nixon Library & Birthplace Foundation, exchanged letters on the requirements to allow the Nixon Library to become the twelfth federally funded Presidential library operated by the NARA by 2007. On October 16, 2006, Dr. Timothy Naftali began his tenure as the first federal director of the Richard Nixon Library and Birthplace, and in the winter of 2006, NARA began transferring the 30,000 presidential gifts from the Nixon Presidential Materials Staff in College Park, Maryland to Yorba Linda, California. On July 11, 2007, the Nixon Foundation deeded the Library and Birthplace to the government of the United States. On the same day, the newly-renamed federal Richard Nixon Presidential Library and Museum officially opened. Before the advent of the Presidential library system, Presidents or their heirs often dispersed Presidential papers at the end of the administration. Though many pre-Hoover collections now reside in the Library of Congress, others are split among other libraries, historical societies, and private collections. However, many materials have been lost or deliberately destroyed. Lucretia Rudolph Garfield, the wife of James A. Garfield, President from March 4, 1881, until his death on September 19, 1881, added a Memorial Library wing, four years after his assassination, to their family home, Lawnfield, in Mentor, OH. James A. Garfield NHS is operated by the National Park Service and the Western Reserve Historical Society. The Presidential library system formally began in 1939, when President Franklin Delano Roosevelt donated his personal and Presidential papers to the federal government. At the same time, Roosevelt pledged part of his estate at Hyde Park, New York to the United States, and friends of the President formed a non-profit corporation to raise funds for the construction of the library and museum building. Roosevelt's decision stemmed from his belief that Presidential papers were an important part of the national heritage and should be accessible to the public. He asked the National Archives to take custody of his papers and other historical materials and to administer his library. 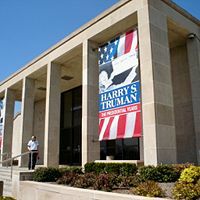 In 1950, Harry S. Truman decided that he, too, would build a library to house his Presidential papers and helped to galvanize congressional action. In 1955, Congress passed the Presidential Libraries Act, establishing a system of privately erected and federally maintained libraries. The Act encouraged other Presidents to donate their historical materials to the government and ensured the preservation of Presidential papers and their availability to the American people. Under this and subsequent acts, nine more libraries have been established. In each case, funds from private and nonfederal public sources provided the funds to build the library. Once completed, the private organization turned over the libraries to the National Archives and Records Administration to operate and maintain. Until 1978, Presidents, scholars, and legal professionals held the view dating back to George Washington that the records created by the President or his staff while in office remained the personal property of the President and were his to take with him when he left office. The first Presidential libraries were built on this concept. NARA successfully persuaded Presidents to donate their historical materials to the federal government for housing in a Presidential library managed by NARA. The Presidential Records Act of 1978 established that the Presidential records that document the constitutional, statutory, and ceremonial duties of the President are the property of the United States Government. After the President leaves office, the Archivist of the United States assumes custody of the records. The Act allowed for the continuation of Presidential libraries as the repository for Presidential records. The Presidential Libraries Act of 1986 also made significant changes to Presidential libraries, requiring private endowments linked to the size of the facility. NARA uses these endowments to offset a portion of the maintenance costs for the library. 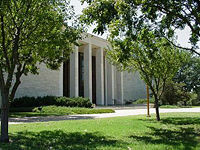 The twelve Presidential Libraries maintain over 400 million pages of textual materials; nearly ten million photographs; over 15 million feet (5,000 km) of motion picture film; nearly 100,000 hours of disc, audiotape, and videotape recordings; and approximately half a million museum objects. These varied holdings make each library a valuable source of information and a center for research on the Presidency. The most important textual materials in each library are those created by the President and his staff in the course of performing their official duties. Libraries also house numerous objects including family heirlooms, items collected by the President and his family, campaign memorabilia, awards, and the many gifts given to the President by American citizens and foreign dignitaries. These gifts range in type from homemade items to valuable works of art. Curators in Presidential libraries and in other museums throughout the country draw upon these collections for historical exhibits. Other significant holdings include the personal papers and historical materials donated by individuals associated with the President. These individuals may include Cabinet officials, envoys to foreign governments, political party associates, and the President's family and personal friends. Several libraries have undertaken oral history programs that have produced tape-recorded memoirs. A third body of materials comprises the papers accumulated by the President prior to, and following, his Presidency. Such collections include documents relating to Roosevelt's tenure as Governor of New York and Dwight D. Eisenhower's long military career. With the exception of John F. Kennedy, Lyndon B. Johnson, and Jimmy Carter, every American president since Hoover is or has chosen to be buried at their presidential library. Kennedy is buried at Arlington National Cemetery; Johnson is buried at his ranch in the hill country of Texas, west of Austin; Carter plans to be buried near his home in Plains, Georgia. This is a list of the presidential libraries. 19 Rutherford Hayes Rutherford B. Hayes Presidential Center Fremont, Ohio Ohio Historical Society & Hayes Presidential Center, Inc.
* As mentioned above, the Richard Nixon Presidential Library and Museum was not originally part of the Presidential library system until July 11, 2007; previously it was the Richard Nixon Library & Birthplace. ↑ Richard Nixon Website, Library. Retrieved May 23, 2008. ↑ www.archives.gov, The National Archives Opens Federal Nixon Library, Releases Previously-Restricted Documents and Tapes. Retrieved May 23, 2008. ↑ findarticles.com, Carter hopes to be buried in hometown of Plains, Ga. Retrieved May 23, 2008. ↑ www.archives.gov, National Archives Names Director of the Richard Nixon Presidential Library and Museum. Retrieved May 23, 2008. Augst, Thomas, and Wayne A. Wiegand. "The Library As an Agency of Culture." American studies, v. 42, no. 3. Lawrence, KS: American Studies, 2001. ISBN 0299183041. Black, A.M. 2005. "The Franklin D. Roosevelt Presidential Library and Museum Digital Archive." Journal of American History. 92, no. 3: 1121. C-SPAN (Television network). Franklin D. Roosevelt Presidential Library Hyde Park, NY. Presidential libraries history uncovered. Washington, D.C.: National Cable Satellite Corporation, 2007. Decker, J.R. 2005. "Abraham Lincoln Presidential Library and Museum." Journal of American History. 92, no. 3: 934-937. Elliott, Jannean L. Presidential Papers and the Presidential Library System. Provo, Utah: School of Library and Information Sciences, Brigham Young University, 1981. Farkas, Mark, Richard Norton Smith, and Allen Weinstein. Presidential Library Series [videorecording]. Washington, D.C.: National Cable Satellite Corporation, 2008. Gupta, Amarnath. Preserving Presidential Library Websites. La Jolla, Calif.: San Diego Supercomputer Center, 2001. Herbert Hoover Presidential Library, Dale C. Mayer, and Dwight M. Miller. Historical Materials in the Herbert Hoover Presidential Library. West Branch, Iowa: Herbert Hoover Presidential Library, 1996. Hufbauer, Benjamin. Presidential Temples: How Memorials and Libraries Shape Public Memory. Lawrence: University Press of Kansas, 2006. John F. Kennedy Library, and Ronald E. Whealan. Historical Materials in the John Fitzgerald Kennedy Library. Boston: John Fitzgerald Kennedy Library, 1993. Lamb, Brian, Susan Swain, Steve Scully, and Richard Norton Smith. John F. Kennedy Presidential Library Boston, Massachusetts. Presidential libraries history uncovered. Washington, D.C.: National Cable Satellite Corporation, 2007. Richard Nixon Library & Birthplace, and United States. Nixon Presidential Library & Museum. Yorba Linda, CA: The Nixon Library and Museum, 2007. Smith, Nancy Kegan. Overview of the Presidential Library System and Subsequent Holdings. [Know Your Records videotape series], Session 17. College Park, Md: National Archives and Records Administration, 2005. United States. Ronald Reagan Presidential Library and Museum. Washington, D.C.: Presidential Libraries, National Archives and Records Administration, 2004. Warner, Robert M. Inside the White House: The Presidential Library System. Muncie, Ind: Ball State University, 1987. All links retrieved June 1, 2015. This page was last modified on 1 June 2015, at 22:53.